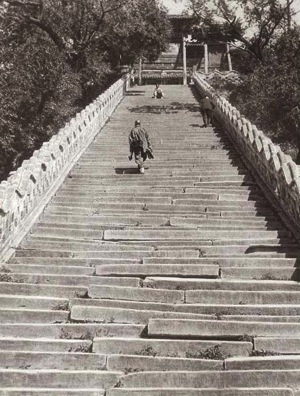 We end the year 2010 with a focus on Ernst Boerschmann's archive of photographic images of late-imperial China. During his extensive travels in the Qing Empire on the eve of revolutionary change a century ago Boerschmann chronicled, as well as artistically captured, a world of buildings, landscapes and sights with an exacting eye, as well as with subtlety and unique grace. This issue of China Heritage Quarterly recollects his achievement in both words and in image, as well as offering a meditation on the significance of this photographer and architectural historian's work in understanding China, and its conflicted heritage, today. We are also very fortunate to be able to introduce the Research Project on Ernst Boerschmann at Berlin University of Technology under the direction of Eduard Kögel. In T'ien Hsia we expand our own archive on New Sinology by reproducing the Inaugural Lecture of Professor Liu Ts'un-yan 柳存仁, presented at The Australian National University on 5 October 1966, and by publishing the description of a project initiated by Carolyn Cartier and Tim Oakes, 'Vast Land of Borders'. The Shanghai historian and cultural critic Xu Jilin 许纪霖 offers sombre personal reflections on China's 'examination hell' and its broader meaning, while a decade-old essay by the Editor is reproduced here as a prelude to more concerted thoughts and reflections on a century of revolution, reaction and reform in China that will feature in our issues in 2011, the anniversary year of the momentous 1911 Xinhai Revolution (Xinhai Geming 辛亥革命). In the Articles section we update readers on the Long Bow Appeal, offer an account of the re-imagined (and heavily engineered) heritage of Qujiang 曲江 in the city of Xi'an 西安 and revisit the fate of the Forbidden City in the Cultural Revolution. 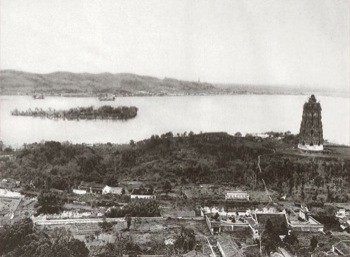 Duncan Campbell recollects the monumental effort of Zhu Yizun 朱彝尊 to create an encyclopaedic account of the Qing dynastic capital during its eighteenth-century heyday, while considering a cheerless encounter with the city that has replaced it. New Scholarship features a report on a symposium on Qing gardens and a research note on the currency of the term the 'Qianlong Garden' (Qianlong Huayuan 乾隆花園). We are also delighted to publish a series of translations related to calligraphy from the remarkable Song essayist, statesman and poet Ouyang Xiu 歐陽修. I am grateful to Nancy Berliner of the Peabody Essex Museum in Salem, Massachusetts, for guiding us to the work of Eduard Kögel in Berlin. My thanks also to Daniel Sanderson for his assistance in editing, design and layout, as well as for his suggestion that we add further readings and links at the end of our articles. Another new development in this issue is the introduction of an RSS feed to which readers can subscribe by following the link at the top of the page. In conclusion, I would like to acknowledge the Australian Research Council which, through a Federation Fellowship awarded to me in 2005, has for the past five years supported a range of research, fieldwork and publishing ventures, including post-doctoral work, the research of PhD scholars and other academics, related to Beijing, its history and modern China. That fellowship formally came to an end in December 2010, although related research and publishing plans will continue to bear fruit over the following years. More details related to the fellowship and its results will be made available 'in due season'. The photographer Ernst Boerschmann (1873-1949) first visited China in 1902 under the aegis of the German Imperial Colonial Office, the Reichs-Kolonial-Amt. He travelled to the Qing Empire to explore the country, and to understand better the people, culture and architecture of China. He was based in Qingdao/Tsingtao 青島, Shandong province, the major German concession which had been ceded by the Chinese government in 1897. During that initial trip Boerschmann also visited a number of other major Chinese cities. At the time he met Joseph Dahlmann, SJ, renowned for his work on India and for his interest in the intersection between the built environment and the philosophical traditions of 'the East'. It was a period when the newly formed German Empire (Deutsches Reich, which was created in 1871 with the crowning of the King of Prussia as its first monarch) was expanding globally; the nascent power was also anxious to prove its credentials as a major force for civilization. 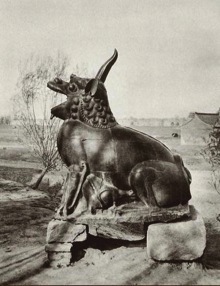 The German Empire's projects in China, such as support for Ernst Boerschmann, were part of a broader aim of creating an encyclopaedic cultural understanding that proved the German scientific understanding of the world and appreciation of the ancient world. Less generously, one could also describe these ventures as being part of the general European colonial scramble in Asia and elsewhere. While cultural ventures such as photographic expeditions may be seen in a relatively benign framework (and lauded in retrospect for the rich legacy that they bequeath), far less forgiving views are equally possible. These relate to the imperial strategies of the aggressively expansionist trading and colonial powers of Europe and America, activities which included the collection of geographical, topographical, social and cultural information. Such material could both pique the interest of audiences in metropolitan European centres in the exotic and different (and provide rich materials for museological and academic collections), as well as provide useful cognizance to those with well-honed political and economic ambitions. The discussions with Dahlmann led, in March 1905, to Boerschmann drawing up an itinerary aimed at surveying Chinese architectural sites. The resulting project was supported by state secretary of the Foreign Office Oswald Freiherr von Richthofen and was awarded funding by the German government. In 1906, Boerschmann began what would be a three-year project, during which time he travelled to over sixteen cities and provinces. In total he travelled twice as far as the participants in the Communist-led Long March that began nearly three decades later. 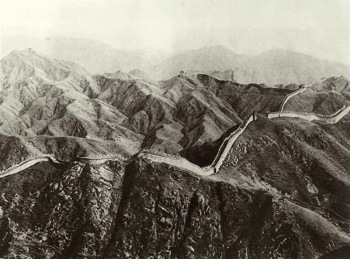 While he travelled widely in China, Boerschmann was frustrated in his attempts to make work related to the imperial city (Huang Cheng 皇城) of Beijing and buildings of the Forbidden City within it: the Qing court denied him access. His was the first systematic attempt to record the richness of China's architectural heritage, the first major display of Boerschmann's photographic work being mounted at the Königliche Kunstgewerbe-Museum in Berlin, 4 June-20 July 1912. Indeed, his field observations in China would set the standard for architectural historians for decades to come. Through the meticulous architectural drawings he made along with his photographs—an archive of great scope and variety—Boerschmann catalogued the various styles of vernacular and sacred architecture that had evolved through China's dynastic history. His body of work also directly influenced, some would claim inspired, members of the Society for Research in Chinese Architecture (Yingzao Xueshe 營造學社) which was established in 1930. 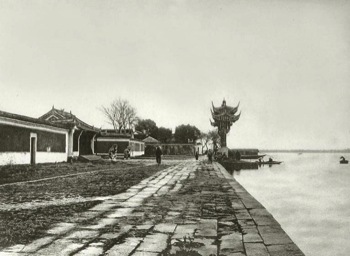 Boerschmann's 1931 work on Chinese pagodas ( Chinesische Pagoden) was translated by Liu Shixun 劉式訓 , a former diplomat who was also a member of the Society, and in 1932 Boerschmann himself was invited to join the Society as an executive member. He made a gift of a number of books to the group but after a reorganization of the Society in 1935 he was demoted to become an ordinary member. Neither knew the grammar of Chinese architecture; they wrote uncomprehending descriptions of Chinese buildings. But of the two Siren was better. He used the Ying-tsao fa-shih, but carelessly. Given the inflamed passions of the past one can understand why the work of figures like Boerschmann was at times breezily dismissed as the product of a man who lacked any serious understanding of the profound wealth of Chinese culture and the unique heritage of its architecture. Whereas we appreciate all too keenly the controversial politics of the late-Qing/early Republican era, and the baleful legacies of colonialism as the Republic of China was struggling to realize the vision of a modern, equitable and democratic polity, we are also powerfully aware of the inspiration that China's heritage, built, natural and human, excited in academics, writers, travellers and thinking individuals. It is in this context, too, that we consider Boerschmann's work as a man who appreciated and recorded the Chinese world that he encountered, and the past that it evoked. In the process he created not only an archive of inestimable academic value, but also a body of stunning beauty. Now, a century later so many of his photographs still have the power to transport the viewer. Today, some China-based academics and specialists find worth and value in the hard-won achievement of Boerschmann. In a greater spirit of generosity—one not as beclouded by political ire, professional pique or cultural discomfort perhaps as in the past—they appraise Boerschmann's photographic study of China, its landscapes and its building styles as being a remarkable contribution to the general wealth of knowledge. For Boerschmann's work predated by many years that of later specialists—such as, architectural historians, photographers and official government recorders. Today he is gradually being recognized for his breadth of vision, the richness of the material he collected and the serious intellectual underpinnings of his enterprise (see the Editorial in this issue for more on this). 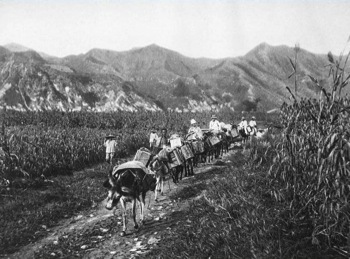 Although Boerschmann published a number of works about China (see the Selected Bibliography at the end of this essay), we have chosen to use Picturesque China: a journey through twelve provinces (Baukunst und Landschaft in China: eine Reise dürch zwölf Provinzen), which originally appeared a century ago, as the basis for a project initiated in 2006 by the oral historian and traveller Sang Ye aimed at revisiting the sites of Boerschmann's work and recording, both visually and through short oral histories, their fate during a hundred years of momentous change. In pursuing this work we believe that Picturesque China reflects well the range of Boerschmann's visual interests as well as the breadth of his geographical engagement with that country. It was also a work created at a particular moment in the late-Qing era, a moment which we believe resonates in complex ways with views of heritage, history and the past in the present. Sang Ye and his collaborators in Australia, China, Taiwan and Canada, include historians, photographers and a specialist in satellite mapping. They are utilizing the selected, publicly available archive of Boerschmann's photographs as collected in Picturesque China to trace a particular history of place. Sang Ye, Jin Xiong 金雄 and Lao Cheng 老成 have been working to identify relevant sites. Photographic work is being undertaken by: Jin Xiong, Xu Yuan 徐原, Ge Xiaoxia 葛小夏, Yu Peng 宇鹏 and Zhang Baotian 張寶田, while background research and the writing up oral history material is being done by Sang Ye with Geremie R. Barmé. Legal advice has been provided by Shi Baojia 史寶嘉. Of the 288 photographs in Picturesque China over 200 were made by Boerschmann himself, another forty or so being the product of Chinese photographers in his employ. Sang Ye and his collaborators have identified the sites of the original photographic works, travelled to them and made photographs from as near to the same vantage point as Boerschmann as possible. Of them forty-two are now protected in China as national cultural heritage sites (guojiaji wenwu baohu danwei 國家級文物保護單位), some have even achieved UNESCO World Heritage status. Another eighty are provincial or municipal-level cultural heritage sites (shengshiji wenwu baohu danwei 省市級文物保護單位). Such status does not necessarily ensure the integrity, or even security, of a particular site. 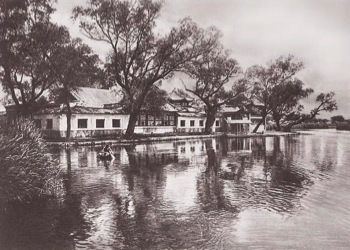 For instance, over twenty buildings such as the Confucius Temple in Qufu 曲阜孔廟, the Grave of Yue Fei in Hangzhou 杭州岳墳, the Jinci Temple in Taiyuan 太原晉祠, as well as the Taishan Temple at Taishan 泰山岱廟 have been substantially or completely reconstructed. Another sixty sites/buildings have disappeared entirely. Natural disasters (such as earthquakes and floods): only 2% of the sites recorded by Boerschmann were lost in this manner. Over the years that this project has been undertaken, Sang Ye has been conducting short oral history interviews with local people—residents, historians, workers, farmers, bureaucrats—which elucidate the stories of these sites. Some trace the century since Boerschmann made his work through a simple narrative; others reflect one aspect of a more complex history. The authors would like to thank Claire Roberts for her comments and suggestions. This short bibliography is based materials at the Phillips Library at the Peabody Essex Museum in Salem, Massachusetts, including resources primarily from the Herbert Offen Research Collection. See also the Catalogue of the German National Library (Katalog der Deutschen Nationalbibliothek). Ernst Boerschmann, Chinesische Architektur, Berlin: E. Wasmuth, 1926. Ernst Boerschmann, Chinese architecture and its relation to Chinese culture, Washington, D.C.: Government Printing Office, 1912. Ernst Boerschmann, Chinesische Baukeramik, Berlin: A. Lüdtke, 1927. Ernst Boerschmann, Die Baukunst und religiöse Kultur der Chinesen, Berlin: G. Reimer, 1911-1931. Ernst Boerschmann, Old China: in historic photographs: 288 views, New York: Dover; London: Constable, 1982. Ernst Boerschmann, Picturesque China: architecture and landscape; a journey through twelve provinces, London: T. Fisher Unwin, 1926. 恩斯特·柏石曼, Xun fang 1906-1909: Xiren yanzhongde wan-Qing jianzhu (1906-1909: 西人眼中的晚清建筑), trans. by Shen Hong, Tianjin: Baihua Wenyi Chubanshe, 2005. For a biographical note on Boerschmann, see Fritz Jäger, 'Ernst Boerschmann (1873-1949)', in Zeitschrift der Deutschen Morgenländischen Gesellschaft, 99 (N.F. 24), 1945-1949 (1950): 150-156. Oswald von Richthofen was was related to both the 'Red Baron', Manfred von Richthofen, a flying ace during WWI, and Ferdinand von Richthofen, a leading academic and geographer and President of the German Geographical Association. For some time the Qilian Mountains in Gansu were known among non-Chinese as the Richthofen Range. For a mention of this Association and Zhu Qiqian 朱啓鈐 (1872-1964) in the pages of this journal, see 'Zhu Qiqian's Silver Shovel', China Heritage Quarterly, Issue 14 (June 2008), at: http://www.chinaheritagequarterly.org/features.php?searchterm=014_zhuQiqian.inc&issue=014. See also Cui Yong, Zhongguo Yingzao Xueshe yanjiu, Nanjing: Dongnan Daxue Chubanshe, 2004; and, Lin Zhu, Zhongguo Yingzao Xueshe shilüe, Tianjin: Baihua Wenyi Chubanshe, 2008. For these details, see Journal of the Society for Research in Chinese Architecture (Zhongguo Yingzao Xueshe Huikan), No.3, Vol.2 (1931) and No.1, Vol.3 (1932). 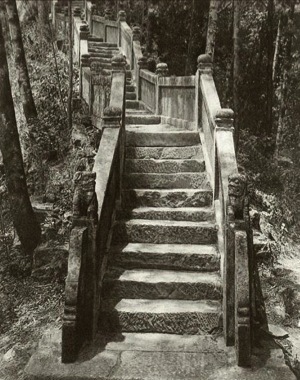 See, for example, Daijo Tokiwa and Tadashi Sekino, Buddhist Monuments in China, Tokyo: Bukkyoo-shiseki Kenkyuukai, 1926. Quoted in Wilma Fairbank, Liang and Lin: Partners in Exploring China's Architectural Past, Pennsylvania: University of Pennsylvania Press, 1994, p.29.